Dementia is a disease that causes a person’s brain to slowly, or quickly, lose part of its functionality. The lack of brain function can turn into a loss of memory, motor skills, communication ability, judgment, and change a person’s behavior entirely. These two forms of dementia are extremely similar in nature but happen in completely different ways. To get a better understanding of these different forms of Dementia, we are going to examine vascular dementia vs Alzheimer’s. Vascular dementia and Alzheimer’s have some symptoms that overlap, and others that don’t. It’s important to understand the difference between the two so you can tailor your care as needed. It’s also important to understand the similarities to see where the general confusion about the two lies. It may not come as much of a surprise, but these two forms of dementia can result in similar issues in a loved one as they start to age past 65. As the years start to stack up, the chances of seeing some form of cognitive decline start to go up with them. Although these diseases are completely different in nature, it has been found that exercise and a heart-healthy diet can really help fight both forms of dementia. Both forms of dementia can take on an early stage, middle stage, and late-stage dementia traits. Vascular dementia comes down to many different factors for its starting point. Alzheimer’s is more gradual. When you boil it down dementia vs Alzheimer’s or vascular dementia, Alzheimer’s and vascular dementia are two types of the same disease: dementia. As we stated before, there are early, middle, and late stages of dementia, but there are is also early onset. Sadly, it’s believed over 500,000 people in the United States over the age of 65 are showing signs of early onset dementia, but simply don’t know it. The early stages of Dementia aren’t as easy to spot because many people believe it’s a normal part of aging to simply forget. Though that can be true, the signs of Alzheimer’s aren’t normal, and they need to be checked out. If you or your loved one starts to forget simple tasks or thoughts in day-to-day life, it’s really time to start showing concern by seeking medical help. On top of the forgetful nature, patients also tend to show signs of a significant personality change. Short-term memory loss, specific activities that don’t bring joy the way they used to, or getting lost in areas the person definitely knows are all major warning signs that action needs to be taken. The middle stages of dementia start to get more extreme, but they follow along with the lines of the early stages of dementia. People may experience the middle stages of dementia at different rates, but there are common signs of its advancement. Long-term memories will start to fade. Spacial awareness will seem to be a struggle. Emotional conditions will continue to polarize in the person suffering from the disease. Deeper feelings of anxiety and paranoia are commonly observed in patients towards the middle stages of dementia. The loss of visual awareness is also very common during the middle stages of dementia. 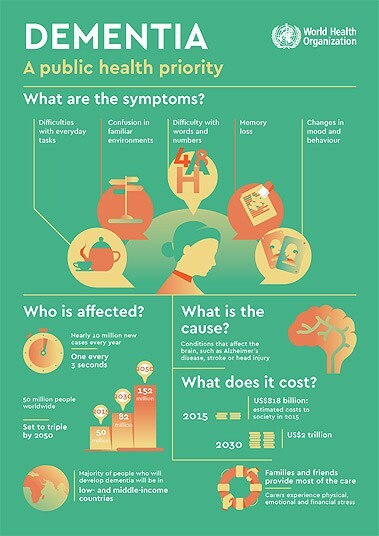 In the later stages of dementia, people start to experience many difficult ailments. There is a general loss of memory constantly. Motor functions start to become intermittent and often halt. Most of the time caregivers are needed for the person in this stage. Patients with late-stage dementia can start to see compromised immune systems, making them more susceptible to contracting other diseases. In general, dementia has a few general warning signs to be aware of, and both of these diseases fall into that group. The first major sign is memory lost the actually affects the person’s daily life. Now, this doesn’t mean I went to the store and forgot an item or two on the list. Episodes like your loved one having a specific drawer for things like keys or water glasses, but not being able to remember where that is. A second major sign is shifting in the ability to plan or problem solve, especially in their own home. Some tasks in life are challenging, but they can normally be tackled with a bit of critical thinking. If you start to notice your loved one is having issues with problem-solving or planning, you need pay attention if that is out of the norm. Yet another sign is confusion with time, space, or speech. Your loved one may start to tell a story, and you should listen because it can tell you a lot about their current state. If they start to tell stories of the past like they are today, ask them when they are talking about. If they start to have issues with spacial awareness, you may see them start to knock over items or bump into walls frequently. Speech can also start to slur as Dementia sets in, so stay on top of your loved one’s speech patterns. Speak to them frequently. The final major sign to keep an eye on is major personality changes. If you start to notice your loved one is experiencing major mood swings or withdrawing altogether, seek help and a diagnosis. Should they stop caring for their work the way they used to, it’s time to jump in. If they don’t want to get up and go to their favorite grandchild’s house down the road like they used to do every day, you need to understand why. If there really isn’t a reasoning or that reasoning seems to come from a place of anxiety or fear, you should seek a doctor’s help. At the end of the day, both vascular dementia and Alzheimer’s are both diseases. Different diseases with the same endpoint, Dementia. These diseases have the overall same effect, but you start to see major differences once you start to understand how they happen. One of the major differences with vascular dementia and Alzheimer’s is the fashion they show themselves. Vascular dementia tends to almost come and go with different variations of severity. One minute your loved one could be “the old them” and the next could see episodes of Dementia the likes of which you have never seen. They call the fashion in which vascular dementia displays itself as a step-like progression. In other words, it comes and goes. On the other hand, we have Alzheimer’s. Though the outcome is generally the same, the progression of Alzheimer’s is more of a downward slope. There aren’t really any moments of bouncing in and out of symptoms. Instead, it tends to simply get worse as the days go on. Although this process tends to be more gradual, you won’t see the bounce backs like you would with vascular dementia. Vascular dementia is normally caused by blood flow being restricted from the brain. We’re talking about things like strokes, transient ischemic attack (TIA), or heart attacks. They can cause massive disruptions in the normal functions of the human body. It is estimated that 10-20% of all Dementia cases are diagnosed as vascular dementia, making it the second most common form of dementia. About 1%-4% of these cases layover into Alzheimer’s too. Though vascular dementia is a common type of Dementia, it can’t always be classified into the general early stages, middle stages, or late stages. It really comes down to the person and the severity of the event that triggered it in the first place. Some cases result in people closer to early signs of Alzheimer’s. Others find themselves thrust towards the middle or late stages. The common risk factors associated with vascular dementia are diabetes, high blood pressure, coronary heart disease, or peripheral artery disease. Vascular dementia can also come in a variety of forms like mixed dementia. Sometimes patients show signs of both vascular dementia and Alzheimer’s. Women are also more susceptible to getting Alzheimer’s. The fact that women live longer means they are more likely to suffer from dementia. Alzheimer’s is the most common form of Dementia, with over 5 million Americans suffering from Dementia. One of the most common questions that caregivers and doctors hear is very simple, “is Dementia genetic?” The answer is there are many forms of Dementia, some that are genetic and others that aren’t. Alzheimer’s, unlike Vascular Dementia, tends to lean more to a genetic disposition over a sudden event causing the disease. It can also happen from environmental and lifestyle choices. Things like smoking, not moving, and an overall lack of exercise tend to show the most direct link to Alzheimer’s. That means fighting it comes down to getting up and moving. Also, it has been shown that lower and middle-income families are more likely to suffer from some form of dementia than higher-income families. If fighting the onset of Alzheimer’s isn’t an option anymore, you can still help your loved ones fight the more intense stages by simplifying how you interact with your loved one. Take everything step-by-step, and you can help them fight against the harsher stages to come. Although it’s still widespread, there have been amazing advancements in medical care for these individuals. As it sits right now, the average age of a person experiencing the symptoms is 84.7 years of age. Make sure you are keeping an eye on your loved ones, especially as they age beyond 65. About half of the people over 85 years of age suffer from the Alzheimer’s or some other form of dementia. Caring for a person showing signs of dementia is a touchy subject. It can be a challenge because it requires you to completely change your approach to interactions. As a person starts to exhibit signs of Alzheimer’s or vascular dementia, you need to start approaching your interactions step-by-step. By simplifying your requests and taking every conversation one step at a time, you can help your loved ones regain confidence in their ability to remember, even if they continue to forget. There is no verified treatment for dementia. Science has proven time and again that a heart-healthy diet and exercise are a great way to combat the symptoms of dementia. Diet and exercise have also shown the ability to slow the detrimental effects of these diseases, although it’s not a cure. During the early and middle stages of vascular dementia or Alzheimer’s, caring for a loved one is something that you can do with relative ease. If you are taking care of a loved one suffering from one of these diseases, creating designated areas and schedules is a great way to stay on track with your loved one. Add labels to areas of the house that are used for those items. A key drawer that holds the car keys can help your loved one associate where they are with what they find. That way, should they need to find an item like reading glasses, they are likely to look in the drawer where you keep all the glasses. Even if they should have an incident in the time it takes to look for what they need, the labels could remind them of what they originally intended to do. Although many people try, caring for a loved one during the later stages of dementia can be an extreme challenge. If you don’t have the ability to look after your loved one all day long, it’s probably best to find them somewhere that can monitor their activity day in and day out. Though the idea is challenging to deal with, there are special facilities that are designed to care of people suffering from diseases like dementia. These specific homes are designed to keep your loved one active both physically and mentally. From daily activities to simple conversation, the care of a specialized dementia care facility can simply be second to none for some people. As a quick word of advice, there is no easy way to talk to a loved one about assisted living with a delicate nature. Make sure to watch your phrasing. Expect your loved one to have issues with motor functions and vision. Don’t expect them to simply be able to handle everything, but don’t hand them the world with a silver spoon either. You need to help them challenge their minds to stay sharp and fight the disease, but don’t make them sit there and struggle endlessly on a simple task. If they should hit a roadblock and become frustrated, don’t take it out on them. Often times, they are completely unable to control their emotions, and their anxiety can get the better of them. Be aware that there are cases of people experiencing these symptoms turning on their loved ones or caregivers. They may think you are an impostor, or they might think you stole something of great importance to them. With that being said, don’t try to argue with a loved one going through fits of anger or anxiety. There is never a point to trying to explain what’s right and what’s wrong. The disease makes it almost impossible for those dots to connect from time to time. Remember, it’s common to witness anger and anxiety in those suffering from Dementia, but you have to remind yourself it is because of a disease. Should a situation arise with a loved one and a caregiver, it might be time to search for a new one or reach out to the facilities to understand how your loved one is being cared for. The other thing you want to check on is why these outbursts are happening. Ask the caregivers about their practices for baths, restroom breaks, meal times, and other areas of contention. Learn their processes, and talk to them about what they can do to make things better for the patients. If they tell you they have 3 people help your loved one shower and it results in an episode, ask them to stop. Sometimes making these simple compromises between all parties involved can result in major benefits for a patient’s mental health. If these incidents continue, you might want to reach out to your doctor. Talk to them about certain medications that could help your loved one control their symptoms. There is no proven vascular dementia treatment or Alzheimer’s treatment. However, there are medications that have proven to be effective at limiting and suppressing extreme episodes. There are medications that could help your loved one slow down the effects of dementia. Remember that these people are suffering from a disease, whether it’s vascular dementia, Alzheimer’s, subcortical vascular dementia, or any form of dementia. They might say a few extra colorful sentences, make silly decisions, and even lash out at you in anger. Sometimes, just taking 20 minutes to reset and try again can result in an entirely different outcome. Keeping a cool head while caring for a loved one during these times can make a world of difference. Getting a diagnosis for vascular dementia or Alzheimer’s can be done with your doctor through a series of tests. Having the conversation about seeing a doctor to get a diagnosis might be a challenge in itself. It can be a sore point for anyone who has to take the testing. Though it might be hard to have this kind of conversation, it’s necessary to see a doctor for a diagnosis. All the testing is necessary to pinpoint the issue. For vascular dementia, doctors run tests on patients that test their basic function skills. They test their cognitive behavior, communication skills, judgment, and memory with several predetermined tests. They typically use these tests in conjunction with an MRI to help determine if the patient truly suffers from dementia. For Alzheimer’s, the process is generally similar. With Alzheimer’s, however, it’s more of a test to eliminate all other possibilities. Things like a lack of vitamin B12 can lead to similar memory issues like those found in early-onset dementia. If there are no other direct correlations to memory loss (like lack of B12), Alzheimer’s is likely the diagnosis. If you or a loved one starts to experience the signs of dementia, it’s time to start talking to a doctor. The pathophysiology of dementia is vast in variety but similar in nature across the board. There are many places you can reach out to for assistance with your loved one suffering from dementia. Whether you need a place equipped to handle everyday life or help around the home: Make sure your caregiver cares the way you do. Many of these care placement centers act like realty companies. That isn’t always the best way to find the right care for your loved one’s needs. Every person’s case is completely individual, so find someone who feels that way when you look for help. Don’t just have your love one thrown into a home that claims to have great care for dementia patients; find someone who will take care of them like their own. There isn’t one correct option when it comes to understanding and caring for a person with dementia. Find someone who wants to work with you. Cooperation and evaluation make these situations easier to handle. Attack them head on, and don’t be afraid to ask for help. Take the time and dedicate the patience to working with the medical team. You will find yourself in a better position to care for the person in need. If you don’t know where to turn, please, feel free to reach out to Above and Beyond Senior Service Placement. We’ll help you find the right care for your loved one’s condition. More importantly, we’ll get the care they deserve. We take a family approach to helping you find the right care for your loved one. We provide you with free, non-biased senior care information and placement services. With over 20+ years of quality placement services, you can rest knowing we’ll find the best care. We have amassed an overwhelming amount of heartfelt testimonials, and they all say one thing: we love our clientele.